Good Morning, Family and Friends. How is your April going so far???? We are finally getting some spring weather here --and it feels wonderful. After a long winter ---feeling, smelling, enjoying Spring is good for the SOUL. Today --let's just take a walk around our yard... Hope you enjoy it!!!!! Visitors in the backyard!!!!! "Stay away from our tulips, Pretty Little Deer!!" 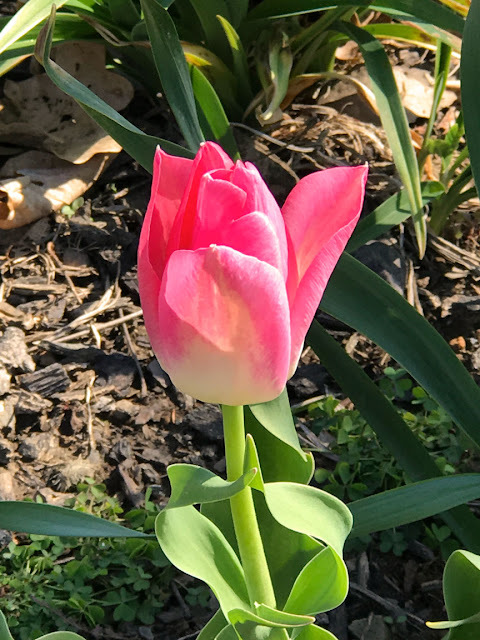 Here is an interesting Tulip in our yard. This little beauty looks different from the others since he/she is a DOUBLE TULIP (with many more petals). Pretty, huh? Same tulip as the one above --after it gets some sunshine and opens up!!! 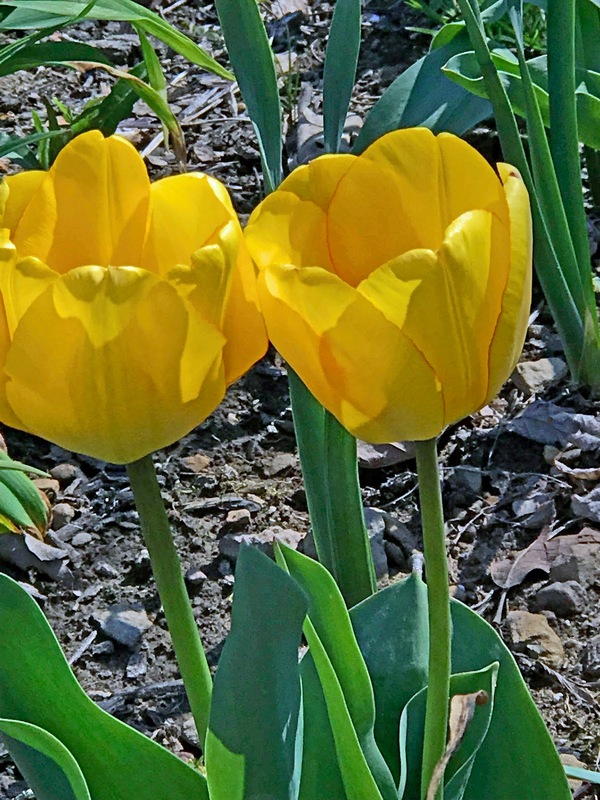 Gorgeous Yellow Tulips; Yellow has always been a favorite Summer Color of mine. Male and Female Purple Finches; I didn't recognize the females at first --and had to search for the name. 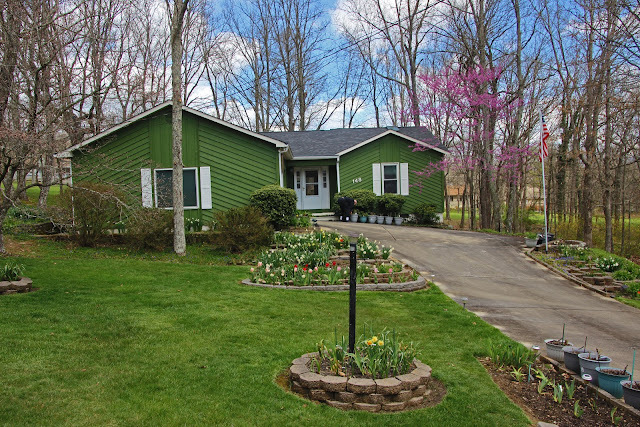 Our front yard and home (4/6/19).... Lots of green grass; See one of our Red Buds in bloom on the right side of our home? Standing under one of our Red Buds and looking up!!!!! I love the Red Bud blooms! Purple Finches love the plate feeder!!!! Look at the females. They remind me of the female Grosbeaks with the big white eyebrow. 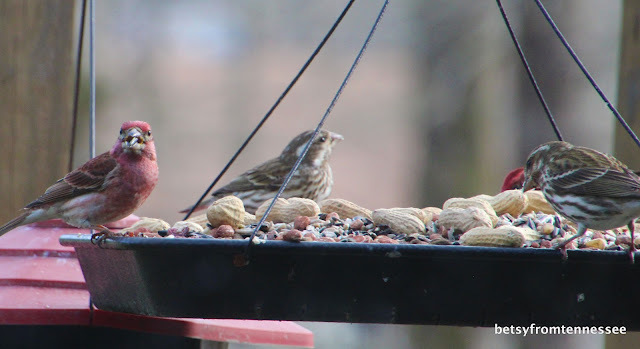 However, they are much smaller than the Grosbeaks!!!! One last picture of the Yellow Tulips --after they open up... Love the red addition!!!! 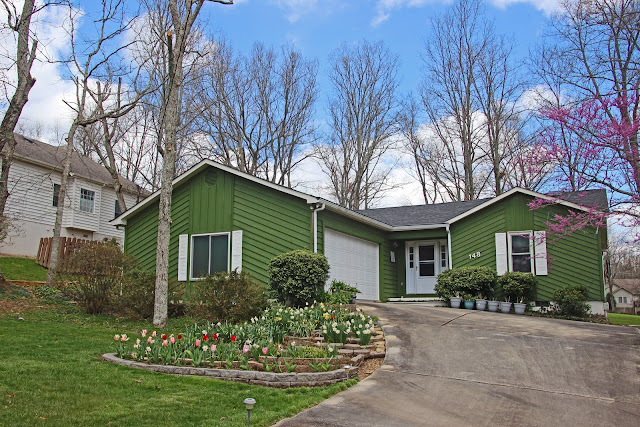 One last picture of our home and yard --taken on April 6, 2019; You'll notice that we still do NOT have any leaves on the big trees here yet.... SO--in some ways, it still looks like winter!!!!!! Even though our winter was warmer and much wetter than normal, March turned out to be COLDER than February!!!! We are just now finally getting some real Spring warm weather.... IF this continues, we'll have leaves on the trees fairly soon. Hope you have enjoyed the walk in and around our yard today... You actually got a little exercise!!!!!!! ha ha..... Have a great week!!!! 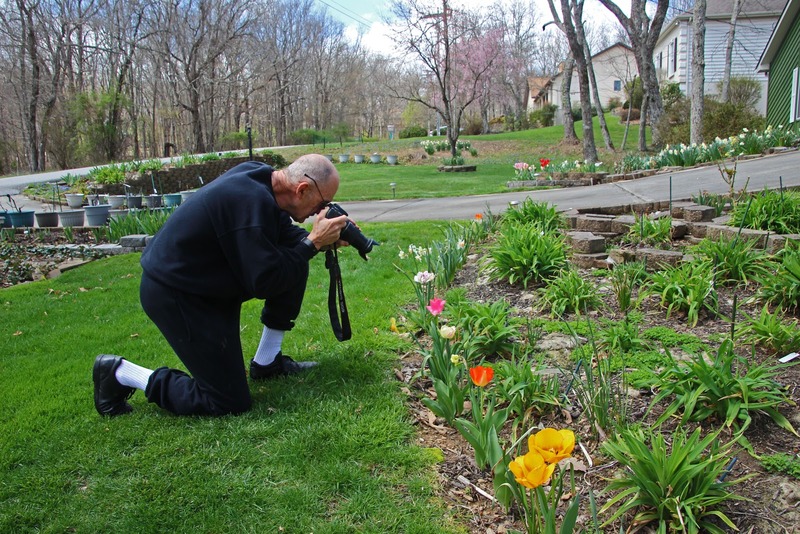 Your home is perfect to photograph in the Spring! It LOOKS like Spring! I love the redbud trees and miss them. The tulips are so pretty and so are the sweet yard birds. Enjoy your week sweet lady! Thanks to hubby for the flower close ups! You did a great job of showing our Spring-time yard. I just hope you can keep those sweet, 'innocent' deer from munching on the roses in the weeks ahead! So colorful and heartwarming . We have no green grass nor really anything popping up yet. We are to get wet snow on Wednesday. I guess it will be more end of April before we reach you stage of colour. Nice to see the good stuff at your place. Hello, Betsy! 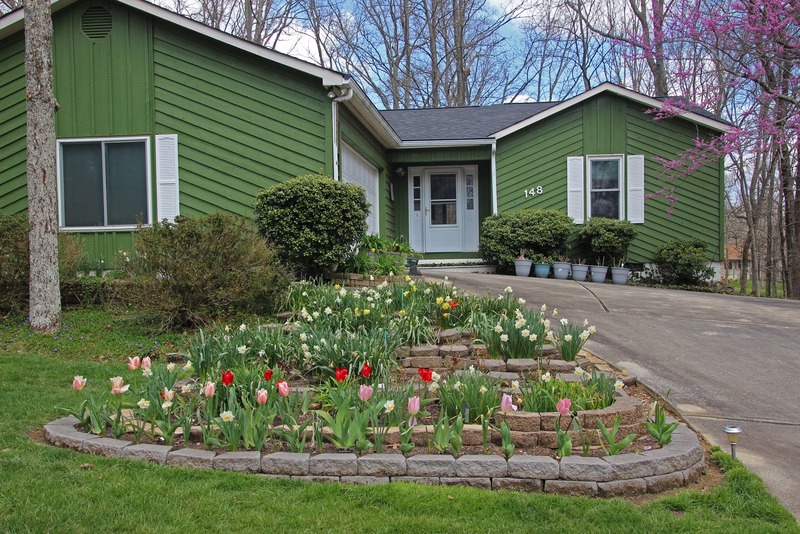 Your spring flowers and yard are looking beautiful. I love seeing the deer, they are so cute. 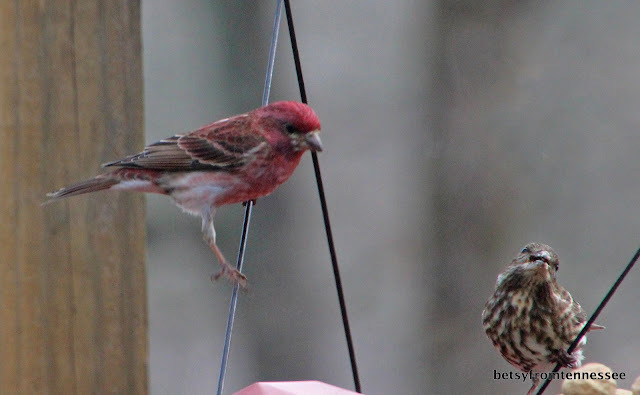 I've been seeing a lot of Purple Finches this year. Lovely photos. Happy Monday, enjoy your day! Wishing you a happy new week! I would take a walk around your yard any day,especially when you are going with me. Love all the Tulips and can't pick a favourite. The Finches are gorgeous. Can you send a few my way soon? Have a wonderful week and enjoy the warmth as it comes. Thank you so much for taking me on your tour!! 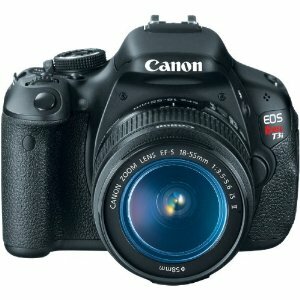 I just love it!! Such a perfect post. It makes me a bit sad, too, that I will never really be there to visit. Let's see, one of my favorites is the gorgeous double tulip with the purple edges. The orange tulip looks like the sun is shining out from the inside! The pink one is soft and beautiful. And the yellow ones all opened are stunning! So those are my favorites. Your post today is just too perfect for me to have just ONE favorite! I love the variety of tulips that you have in your garden. So much colour. Betsy, I enjoyed seeing the tour of your yard. It is looking quite beautiful for spring. I especially enjoyed seeing your flowers and your deer visitors. Hope you have a great week ahead! What a beautiful post!!! I loved that walk around your lovely home and yard!! From the tulips to the red bud tree, the adorable birds...purple finches to the deer you all have a gorgeous home that just makes me smile!!! The tulips are such a welcome sight. It'll be a month before we see them here. LOVE the Redbud! Tulips are ok too. I hope the deer doesn't get your BEAUTIFUL tulips. I would love to see your whole house - I know it is beautiful! My first thought, when I saw your header, was "This CAN'T be in their yard!!!" My second thought was that it was at the Biltmore, which was confirmed when I read the statement under the header. Such beauty they cultivate there at the Biltmore. But you and George are no slouches in the "cultivating beauty" department. Your yard is already showing off your handiwork. And the redbud is the crowning glory. I like how you have your flower garden sloped with stone. We need to have something done with our front yard slope to the side. The sidewalk when it rains becomes a trench. We are having the yard sprayed today for ticks, the deer I noticed are in the back yard and every year the ticks get us as soon as we walk out. Never knew they would eat azaleas. Pretty animals but I just don't want them close. Some gorgeous shots, here! I LOVE those yellow tulips. And love the redbud, too. What a lovely spring-time post this is. Loved seeing the tulips, they are lovely colours. You have some very nice garden birds and how about the deer! I hope they don't eat/disturb your daffodils. PS Many thanks for your recent comments on Eddies blog post and the link too. Yes I enjoyed seeing all those beautiful tulips and birds. Enjoy Spring while we enjoy cooler weather. 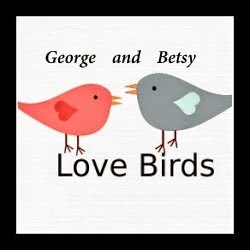 You and George have a lovely home, well cared for! I love all the flowers, birds that visit and the deer too. THESE PHOTOS TOOK MY BREATH AWAY!!!! You're a couple of weeks ahead with your blooming. Such a blessing to know we're right behind you! !